Trophy Hunters Alberta's mandate is to make every effort to ensure an enjoyable trip and a memorable wilderness experience, while at the same time hopefully providing an opportunity to 'bag the big one'. We offer the most diverse hunting terrain in all of Alberta for big game hunts. No other Outfitter is able to customize your hunt as much as THA. Trophy Hunters Alberta has the best track record with five APOS awards for our hunter achievements. 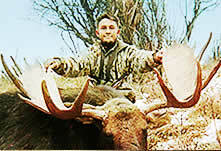 We focus our hunting efforts on what we do best, hunting mule deer, moose, whitetail deer and elk. Other huntable species include wolf & coyote. Our bear hunting opportunities are limited to providing bear licenses only as secondary species on some moose hunts. As a 100% fair chase outfitter, THA does not provide baited spring bear hunts. Hunters should see a variety of big game opportunities. We cannot guarantee a kill, but we can guarantee hard work and hopefully, the hunting experience of a lifetime with the potential for world-class results. We will help you spot the game. You decide whether it meets your criteria, and if so, the hunt will be on. We utilize many hunting techniques, be it calling, spot and stalk, working the bush, ground blind hunting behind camo or in a simulated hay bale, tree stand hunting or some combination of these proven techniques. We all want to harvest a book animal, however, in the sport of hunting, this just does not always happen. Booking your next hunt with THA will certainly improve your odds.